Once I learned to cook shrimp this way, it was over for me ordering take out, enjoy! First make your dipping sauce. Mix the Thai chili sauce, ginger, Sirachi hot sauce, lime juice, ketchup and fish sauce. Taste and adjust seasoning to your taste and refrigerate until chilled and flavors come together. If you are cooking the prawns with the head on, remove the long antennas from the prawns by simply pulling them, they should pop right off. Then in a large bowl, whisk together flour, cornstarch, baking soda, egg and 1/2 cup of ice water. Whisk in remaining water, 1/4 cup at a time, to thin batter. Place bowl in second bowl filled with ice water. Pour enough oil into wok or Dutch oven to come about 2 inches up the side; heat until deep-fryer thermometer registers 375 F.
Add a few shrimp at a time and do not crowd them in the pan, and cook them about 3-4 minutes per batch until they are golden and drain on paper towels. Transfer to platter and garnish with scallions and serve with dipping sauce. Bon Appetit! 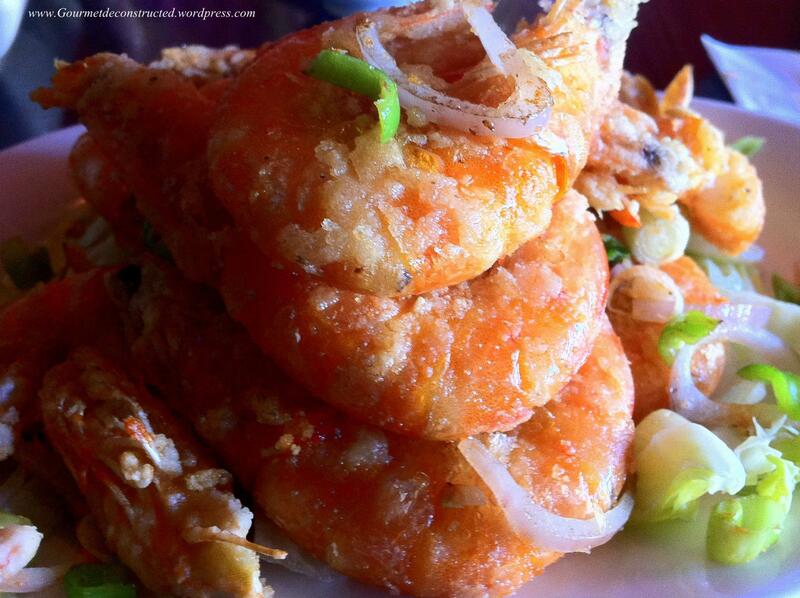 Posted on January 15, 2016, in Seafood and tagged chili sauce, crispy shrimp, deep fry, fish sauce, ginger, lime, prawns, seafood, shrimp, sirachi sauce, spicy seafood, sweet & spicy, tempura, thai cuisine. Bookmark the permalink. 1 Comment. Beautiful shrimp!! It’s easy to make a wonderful dish when you have wonderful and fresh ingredients.